Netflix’s latest foray into original drama shines a spotlight on three crucial years (1304-1307) in the life of Robert the Bruce, the king who would eventually win independence for Scotland at the Battle of Bannockburn in 1314. 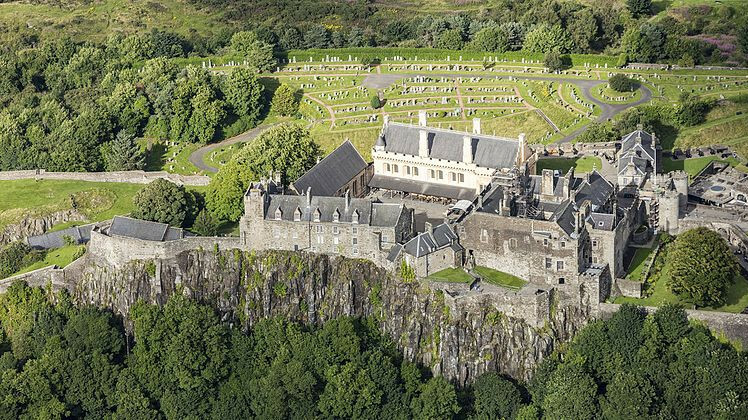 We first meet Bruce two years before his 1306 coronation as he surrenders to King Edward I at the siege of Stirling Castle. This opening scene sets the tone for the savage and blood-thirsty behaviour of the English throughout. The castle is already won but Edward unleashes the Warwolf – a massive trebuchet – to make his point: Scotland is his to crush as he chooses. 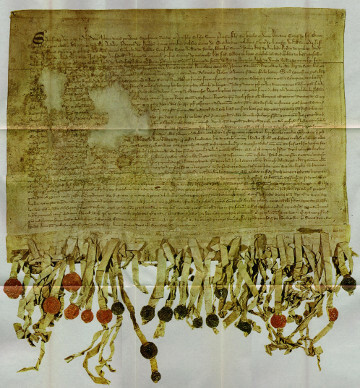 Clearly the Scottish lords (who are by no means united) aren’t too thrilled about this but it takes the public display of William Wallace’s rather meaty arm to get them riled up and ready (most of them anyway) to stand behind their new king and strike back against their English oppressors. There are many good things about the film. The scenery is spectacular. Not only the castles but the rolling empty landscape which becomes a character in its own right: sweeping aerial shots depict the scattered and stranded nature of Bruce’s small guerrilla force, and its seemingly hopeless struggle against the polished English war machine, far more effectively than any of the dialogue. This characterisation is ably supported by the film’s striking score and the cinematography which has a flavour of Bruegel about it. There are strong performances. Chris Pine is no gung-ho Braveheart: his Bruce is a reluctant hero and a sympathetic character who wears the weight of kingship heavily as it costs those around him their lives and their freedom. Florence Pugh gives body and wit to a rather sketchy Queen Elizabeth and the scenes between her and Pine are where the film finds its humanity. Stephen Dillane plays a menacing, tyrannical Edward I with great relish, particularly in the scenes where he bullies the needy and cruel Prince of Wales – a less successful performance by Billy Howle who is hamstrung by a cartoonish character and one of the worst haircuts outside the first series of Blackadder. There is gore but it’s not overdone -the jumbled chaos of the battles felt visceral and real. 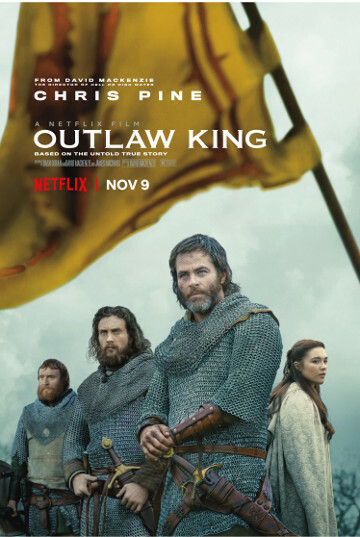 So why does Outlaw King feel less than the epic it’s clearly striving to be? Like many historical films it plays fast and loose with the facts. I don’t mind a bit of cinematic embellishment if it enriches the story but here it doesn’t. It’s irritating in terms of Elizabeth, who is given the fate suffered by Bruce’s sister not his wife, and ridiculous in the case of the Battle of Loudoun Hill. I won’t give away any spoilers but just make sure you’re not sitting near anything you’ll crack your dropping jaw on. The biggest problem Outlaw King has, however, is in its script and editing. Five writers worked on the film which may explain why it feels like a parcel of flung together, unexplored and unfinished ideas. One of the characters makes the observation that “William Wallace wasn’t a man, he was an idea. A dangerous idea.” Oh good, I thought – here we go, an examination of the nationalism that Robert the Bruce is still so strongly identified with. No: that line was it. Unfortunately this skating over themes means there is no real sense of why anyone was prepared to die for Bruce, who wasn’t universally popular and had brought a brutal war back into an already exhausted country. The English are, unsubtly, depicted as monsters but Pine, although he does his best, isn’t given any inspiring moments. And there’s no conclusion – the film suddenly crashes to an end seven years before the definitive Battle of Bannockburn and those years, and their legacy, are summed up in a series of quick captions while love triumphs on the beach. 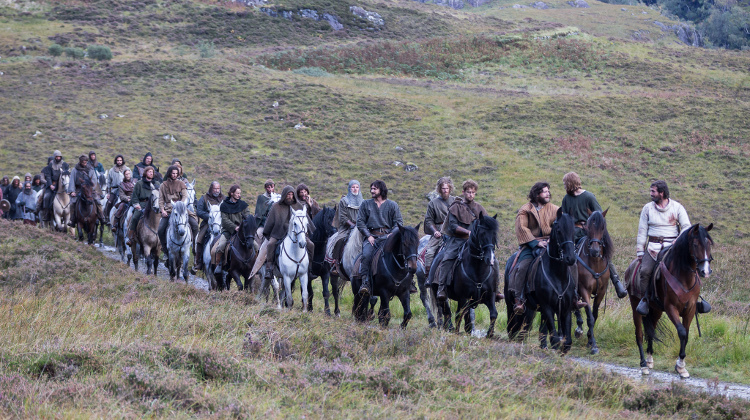 Outlaw King is worthy and efficient and perfectly watchable but, ultimately, it plods. Given the times we are living in and the deeper resonance with the debates around Scottish nationalism and independence this film could have had, I was rather hoping to be inspired. 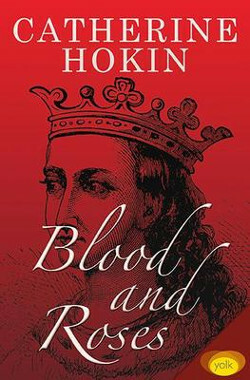 Catherine Hokin’s novel, Blood and Roses, brings a new perspective to the story of Margaret of Anjou and her pivotal role in the Wars of the Roses. Catherine’s short stories have been published in magazines including Writers’ Forum, Mslexia and iScot and will be included in the forthcoming Scottish Arts Club Anthology. She blogs monthly for The History Girls.